On March 9, 1916 the border town of Columbus, New Mexico was attacked by forces under the command of the Mexican revolutionary, Pancho Villa. Eighteen Americans were killed and a number of buildings were burned to the ground before the U.S. Cavalry, inflicting heavy losses, drove Villa and his mounted band back into Mexico. Frank Tompkins, a Major in the U.S. Cavalry at the time, led the counter-attack against Villa’s mounted men on March 9th, and was with General John "Black Jack" Pershing during the subsequent year-long "Punitive Expedition" that sought to capture the elusive Villa in Mexico. The Columbus Raid and Punitive Expedition proved to be the last major campaign of the U.S. Cavalry. At the same time it presaged the more modern military techniques that would soon be employed by American forces in World War I. 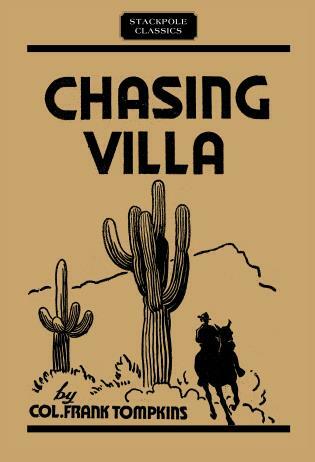 First published in 1934 and long out of print, "Chasing Villa" is a sound and literate record of milestone events in Western history, military history, the Mexican revolution, and the last of the horse cavalry. Colonel Frank Tompkins was born in 1868. Instead of going to West Point like his father and grandfather before him, Tompkins entered the army directly in 1891. He graduated from the Infantry and Cavalry School at Fort Leavenworth in 1897 and became a captain in 1901. For the next nine years, he commanded expeditions in the Philippines, Mt. Banahao, and New Mexico, until he was detailed as Professor of Military Science and Tactics at Norwich University, Vermont. Tompkins retired after 30 years of service, having revolutionized and upheld the standards of cavalry and military service.